It was business as usual Monday for Bowles, whose job status appeared extremely shaky after the Jets’ embarrassing 41-10 loss to the Buffalo Bills on Sunday , their fourth consecutive defeat that dropped the team to 3-7. “We picked a bad day to have a bad day,” Bowles said during a conference call. Fans at MetLife Stadium booed the team throughout and chanted for the Jets to fire Bowles. That sentiment was echoed by many fans on social media and sports radio Monday morning. Several published stories also speculated that the time to make a change would be now with the Jets heading into a bye-week break. Instead, owner Christopher Johnson opted to not fire Bowles. The two were scheduled to have their usual Monday meeting later in the day, but no change in Bowles’ status was expected. For many, it’s a surprise that there will even be another game for Bowles to coach with the Jets. 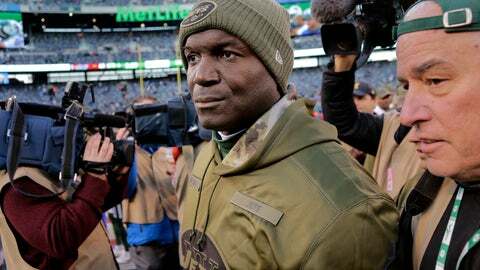 He is 23-35 during his run with the Jets, a .397 winning percentage that is better than just one coach in franchise history with at least 30 games in charge: Rich Kotite (.125). And, as anyone familiar with the team knows, that’s one name you’d prefer to not be associated with. The Kotite years, when New York went 4-28 during the 1995-96 seasons, are synonymous with losing. It’s not nearly as bad with Bowles. But there hasn’t been much winning, either. Consecutive 5-11 seasons followed, and now there’s this increasingly dismal one, in which even five wins might be tough to come by. And, Bowles doesn’t need to look far to point blame. “I take all of it,” he said. That’s the noble approach, but there’s plenty of culprits: playing a rookie quarterback in Sam Darnold; a struggling offense under coordinator Jeremy Bates; a wildly inconsistent defense and a lack of overall roster depth — something that is a big strike against general manager Mike Maccagnan. The fan base is understandably frustrated and restless, and keeping things status quo will do little to appease those who wanted to wake up Monday morning to the news that Bowles was gone. So, the fired-up criticisms at the stadium and on the airwaves will continue, and Bowles knows it. In some respects, it would have been a bigger surprise if the Jets had fired Bowles at this point. Parting ways with a head coach in the middle of the season is rare for the franchise, and has never happened since Woody Johnson purchased the team in 2000. Christopher Johnson, who is running the team while his brother has the role of U.S. ambassador to the United Kingdom, apparently believes it’s better to see the rest of the season through with Bowles and make the final decision on the coach — and, perhaps, on Maccagnan — after the final game. After all, there’s no other coach on the current Jets staff with previous NFL head coaching experience. Only wide receivers coach Karl Dorrell has even major college head coaching experience. So there would have been no clear-cut option to take over to finish the season. That’s not to say there won’t be any changes. Bowles wasn’t considering shaking up his coaching staff at this point, but wouldn’t rule it out. This could all be moot in seven weeks, of course, when the Jets could — and likely will — move forward without Bowles. But until then, he’s focused on somehow figuring out how to salvage this rapidly deteriorating season.